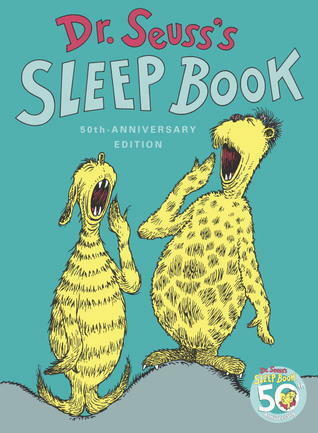 Dr. Seuss's Sleep Book is a 1962 picture book written and illustrated by Dr. Seuss. It shows what a large number of people or animals do to prepare for bed or what happens after they fall asleep. Bad Dreams: A goose and moose who dream they're drinking the other creature's juice will wake up screaming. Eleventy Zillion: At the end of the book, "99 zillion 9 trillion and 2" animals are asleep. Failure Is the Only Option: Zizzer-zoof seed salesmen are not very successful, because no one wants their wares. "Getting Ready for Bed" Plot: Everyone is getting ready to go to bed for the whole of this story. Go-to-Sleep Ending: A meta example; the book ends with the narrator talking the reader into going to sleep. For Want of a Nail: Had Van Vleck, a tiny bug, not yawned, all those creatures would still be awake. Make Me Wanna Shout: An unintentional example; Snorter McPhail and his band of snorers have to sleep in a cave twenty miles away so that they don't destroy the town with their nightly snores. Sleepwalking: A number of the creatures walk in their sleep. Talking in Your Sleep: Brothers Jo and Mo Red-Zoff, the world's finest sleep-talkers, have been at it every night for 55 years, discussing a variety of topics with each other. Tongue Twister: The "moose/goose juice" portion of the poem.